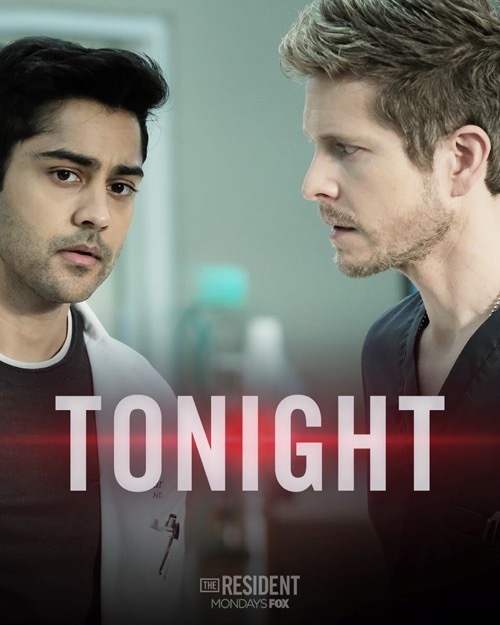 The Resident season 1 episode 8 airs at 9 PM – 10 PM ET on FOX. Make sure to bookmark this spot and come back for our The Resident recap! While you wait for the recap make sure to check out all our television recaps, news, spoilers & more! Lily receives chemo in the clinic. After she heads home and is too weak to walk. She goes to see Conrad and Nic. They sit with her and talk, trying to calm her down after a panic attack. Conrad gets paged to the ER. A woman by the name of Katherine has been brought in. Conrad wakes the next day, puts on a suit, looks at the boxes he has packed in the living room and then leaves. He drives past a sold sign at the end of his driveway. Meanwhile, Nic and Mina bring puppies in to play with the sick children. Mina leaves. A puppy trails her out into the hospital. An older female patient sees the puppy and takes him, putting him in her bag. Nic notices the dog is gone. Katherine comes to. She and Conrad talk. They haven’t seen each other in 11 years. They reminiscence about their younger years together. Nic comes in. Conrad introduces her as an old friend. Katherine corrects him, telling Nic she is his former fiancé. Nic is surprised to learn this. She never knew. Conrad tracks down Lane and apologizes for undercutting her with her patient. He warms up to her, as they talk about how tough it is to treat patients that are so sick. Lane tears up and hugs Conrad after he calls her a great doctor. Devon meets with his overweight patient who has diabetes and has already lost a foot. He has only lost 2 pounds and he cannot stay away from comfort food. He lives with his mom after all. Devon suggests that maybe one of the puppies could help him by being a friend and forcing him to go for walks. The dog’s name is donut. Conrad brings good news to Katherine. She is pregnant. She has been trying for 2 years. Conrad knows how much this means to her. Nic visits the older lady and asks her about the puppy that has gone missing. The lady denies having the puppy. Conrad comes out of Katherine’s room and sees Nic. He tells her to ask away. He explains that Katherine broke up with him after he punched his dad in the nose at their rehearsal dinner. He did love her but now he just wants to help her. Bell is at his lawyer’s office. He is told that his divorce is final. Meanwhile, Conrad looks at the x-ray of Katherine’s abdomen. Nic and Conrad meet with Priya and Devon. Priya doesn’t have enough on Lane, just a handful of patients that said she saved their lives. Claire calls Bell in. She wants to shine a light on surgeons who lose their patients to complications. She feels as though they could be covering something up. She is having cameras installed in all the ORs. Bell looks scared. Conrad and Devon prep Katherine for a procedure to remove a blockage that they hope can prevent her from having surgery. Nic comes in and talks to Katherine alone who tells her she has noticed how much Conrad has grown up. She notices the ring Nic is wearing. It was Conrad’s mother. Lily is having an extreme reaction to her chemo. Lane comes in. Devon informs her of what is going on. Conrad hunts down Bell and tells him that Katherine is a woman who changed his life. She is pregnant. He needs to make sure the surgery is a success. He wants someone else to do it. Lily is in her hospital bed. She is crying. She tells Lane she doesn’t want any more chemo. Lane pacifies her and then leaves. Devon stays behind. Lily cries to him. Jude and Mina scrub in. They begin operating on Katherine. Her abdomen is filled with blood. They cannot find the source. She is losing blood fast. Conrad runs down the hall to get another look at her x-rays. He finds something and runs back. She has an ectopic pregnancy. They stop the bleeding. Her heart rate returns to normal. Nic checks in with Conrad. She is glad to hear Katherine is okay. She asks him why he didn’t tell her that he gave her his mother’s ring. He wanted her to feel like it was hers alone. His mother told him to give it to the love of his life. Lane asks Nic to get back on Lily’s case. She wants Nic to give her 40 ml of potassium before she leaves. Lily is asleep with the puppy in her bed. Devon brings Priya home a puppy after he missed her birthday 2 days before. She laughs with excitement. Conrad is at the nurse’s station. The alarm goes off. It is Lily. Conrad runs to her room. He thinks she has chemo-induced myopathy. They hit her with the paddles. No pulse. They do it again and again while Conrad yells. Her heart rate hits 0, she is dead. Conrad jumps on top of her and keeps trying. Conrad slides down to the fall and cries.